Many parents approach potty training with the same enthusiasm they would have for gum surgery; it's a necessary evil to be tolerated. It doesn't have to be all drudgery if you use a little creativity to make it interesting for everyone. One of the biggest obstacles to getting started with potty training is that each child takes to it differently; what worked for one parent and child won't work for another. Some children don't even need potty training; they'll simply begin imitating older children or adults without considering that they're supposed to be kicking up a fuss about it. This is particularly true of kids with older siblings. Other children need to be begged and bribed. Some children take to it immediately after long tantrums and still others take forever but never complain. It's useful to remember that you're not trying to teach your child how to use a toilet or a potty...you're teaching them to recognize the sensations in their body that signal the need to use the toilet. As with so much else in a child's early development, the age at which you should begin potty training depends entirely on the child. Speaking generally, potty training may begin as early as one year and may be completed as late as four years of age, but this is totally flexible. Potty training is a process of trial and error, and there should be as little pressure as possible on the parent and on the child. If you're trying to wean your child off diapers and onto the potty, but it's starting to turn into a battle of wills and exchanges are becoming heated and unhappy, then stop and try again in a month or so. Parents often report that the most successful time to begin potty training is when the child shows an interest in learning. 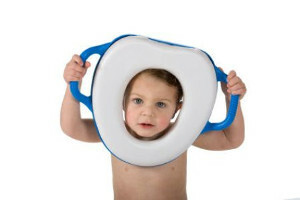 There are a number of potty training products on the market designed to ease the transition to potties. The first and most important is the potty itself. The right potty can make all the difference If your child actually wants to sit on the potty, as opposed to thinking of the potty as an obstacle that needs to be overcome, she will find the learning curve a little smoother. The potty needs to be stable and sturdy, so there's no risk it will tip over, especially when your child is on it. It should be shaped and contoured for his comfort, and he should fit snugly on it. It should be bright, colorful and attractive, not lifeless and sterile. It needs to be easy to empty and to clean, and it should be transportable; that way you can take it with you when you're traveling, and your child will still have a familiar potty. And, have your child help choose the potty, so she'll be more inclined to use it. Let your child be part of the potty training planning process. Take her shopping with you and let her choose her own big girl potty, underwear and stickers to use on her potty training success chart if you use one. Offer plenty of praise and encouragement when your child uses the potty successfully. Check out our "Ways to Say Good Job!" Don't get angy. Don't lose your patience or your temper, and don't introduce any element of shame into the process. Boys tend to be slower -- by as much as six months or so-- be patient! Buy clothes that can be easily and quickly removed by your child. Becoming tangled in loose clothing might result in an accident. Some parents are reluctant to give rewards for potty training success because they feel the child is only doing what he's supposed to do anyway. Others have great success with potty training charts where a child places a sticker each time he uses the potty, with a small reward is earned for every few stickers. Rewarding children for good behavior reinforces the behavior. Rewards don't have to be candy or snacks and are better if they aren't. A trip to the park, an extra story at bedtime, special recognition for an accident-free day all work to motivate the child to do well again. Take a look at our Potty Training Reward Coupons. By spending a little time thinking of creative ways to potty train your child, you make the process more interesting and less of a chore for everyone. When Are Kids Ready to Potty Train?